GOA VP Dr. Karen Pilgrim (seated on BMX 2nd left) take time out for a photo with the winners and other top performers at yesterday’s Annual GOA Olympic Day Cycling Meet at the National Park. This event which forms part of the celebration of Olympic Day worldwide, was included in the Olympic Charter in 1978 encouraging all National Olympic Committees (NOCs) to organise activities which promote the Olympic Movement. 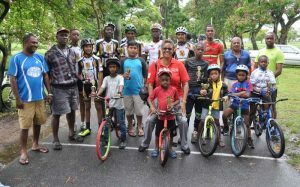 Yesterday’s activity, which saw Guyana Olympic Association (GOA) Vice President Dr. Karen Pilgrim delivering remarks to the cyclists following the presentation of trophies, saw five races contested. Coming out winner in the junior/juvenile 10-lap contest was Nigel Duguid who won the event in 24 Minutes 36.11 Seconds; second was Curtis Dey with Jason Cameron, third. The 12-14 race, another 10-lap showdown, was won by 13-year-old Jonathan Ramshchit also in the same time as junior/juvenile race. He crossed the finish line in front of fellow Berbicians Kenwyn Collins and Jomar Holigar. The lone mountain bike participant was Ryan Canterbury, who, despite not having opposition rode the Mountain Bike Course at the National Park in excellent fashion despite its soggy nature. Nigel Duguid, a comfortable winner of the junior/juvenile 10-lap race yesterday. Barrington in 10 Minutes 52 Seconds. Shay Sue Hang came third. Lumesh Singh won the 6-9 BMX race from Alpha Harrison and Tylor Goring. 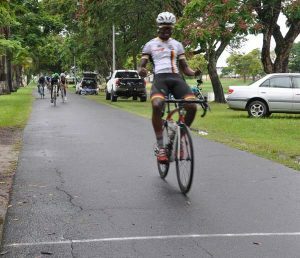 Organiser, Hassan Mohamed, Racing Secretary of the Guyana Cycling Federation (GCF), thanked the participants and parents, especially those from Berbice who braved the rain in making this year’s event another success. GOA VP Dr. Pilgrim in her remarks also expressed gratitude to the participants for taking part in the programme noting that Olympic Day is celebrated on June 23rd, each year by the affiliates of the International Olympic Committee. She reminded the cyclists that on this day, it is important to remember the basic principles of Olympism, one of the main ones being, Fair Play. Dr. Pilgrim encouraged the riders to ensure they attend Anti Doping Education programmes which are held by the GOA and to guard against falling into the trap doping, pointing out that it is an international challenge. Meanwhile, Mohamed’s Teach Them Young Summer Programme which is sponsored by the National Sports Commission is set to pedal off from July 10 – September 1, 2017. It is the 41st year for the programme.